On Admissions Day, September 9, 2017, the State of California celebrated its anniversary of joining the United States of America as its 31st state some 167 years ago. At the time of admission in 1850, California was known, first and foremost, for it incredible wealth in the form of gold. 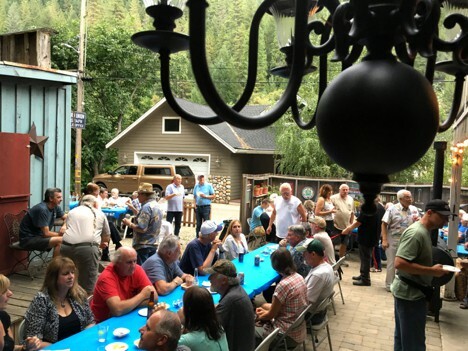 Many towns were instantly born during the gold rush, including Downieville, now a sleepy mountain village tucked away in a steep forested canyon on a branch of the Yuba River. Still relatively isolated it has received a good influx of outsiders once a year for the past twenty years, for the annual Downieville Bottle Show. A hardy bunch of dedicated bottles collectors have made the trek to this isolated spot to enjoy comradery and possibly add a treasure to their collection. Perhaps just as important as the show were the consumate hosts of the “get – together” barbeque the evening before, at their residence. Rick and Cherry Simi, one of the sweetest couples on this earth, opened their charming mountain residence to many of the western region show attendees. It is always a night to remember for many reasons, but mostly for the food and company. After an amazing run of all these years the Simi family has chosen to take a well deserved hiatus from their yearly commitment to this event, which likely will spell the end for the show itself. 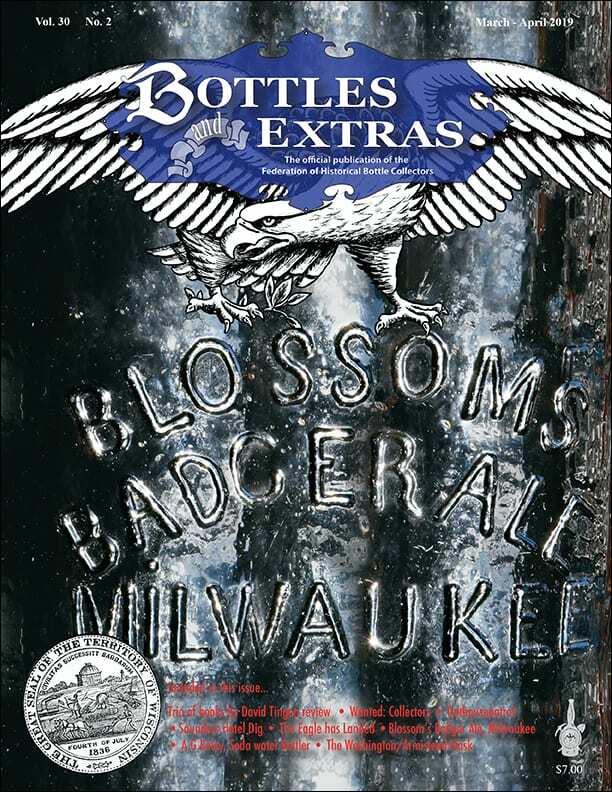 Rather than criticize I wholeheartedly commend Rick and Cherry for their selfless dedication to the bottle collecting community and wish them some rest and relaxation during the usually hectic preparation time that the first part of September has befell them for the past two decades. To be sure, they will be staying in the limelight as Rick still hosts his ever popular Western Bottle News blog. 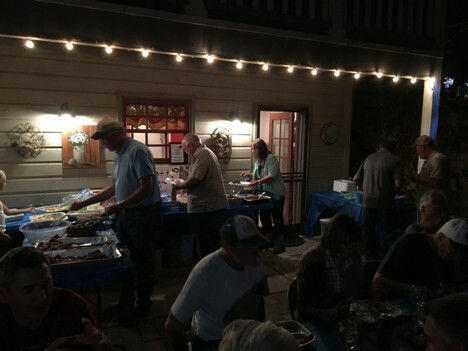 The crowd gathered from all parts of the West as the evening progressed, and the guests arrived. The main road, Highway 49, was in a state of intense repair. This effectively doubled the time it normally takes to get to Downieville from the nearest points of civilization – from one to about two hours. 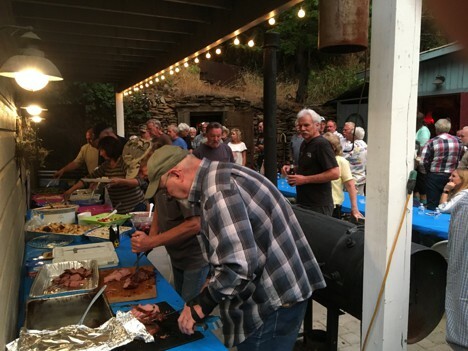 Host, Rick Simi, front and center, makes sure the guests are treated to steak that is barbequed to perfection. Note the doorway in the center background, which is the opening to the Simi’s “gold mine”. 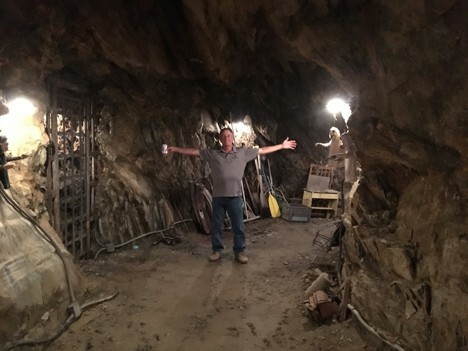 Richard Siri, Jr., took some time out to explore the mine. Meanwhile, the party and food continued into the night. 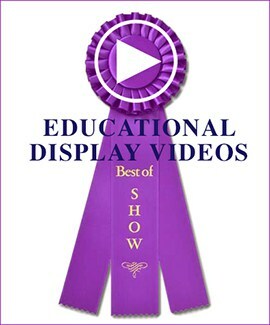 The next morning the show opened its doors at 8:00 a.m. in the local school gym. 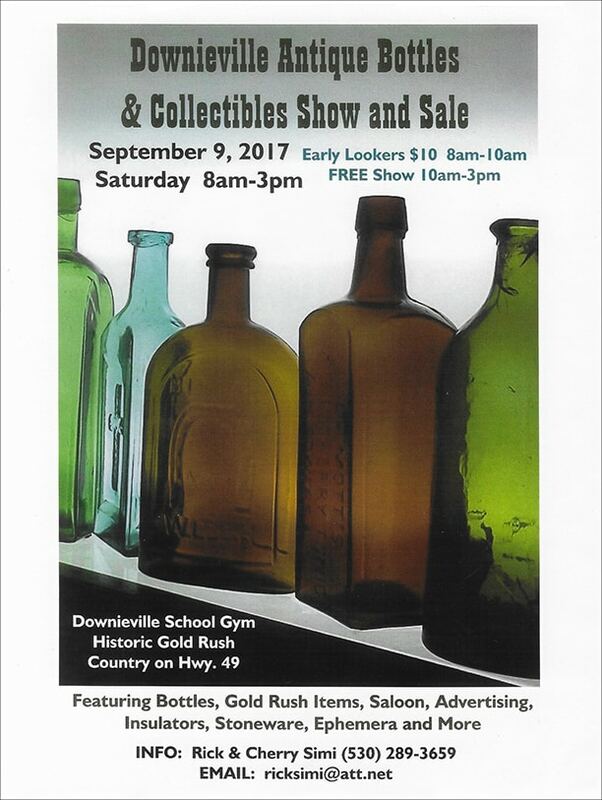 Long time collector, George Wagoner is seen here selling some of his bottles. 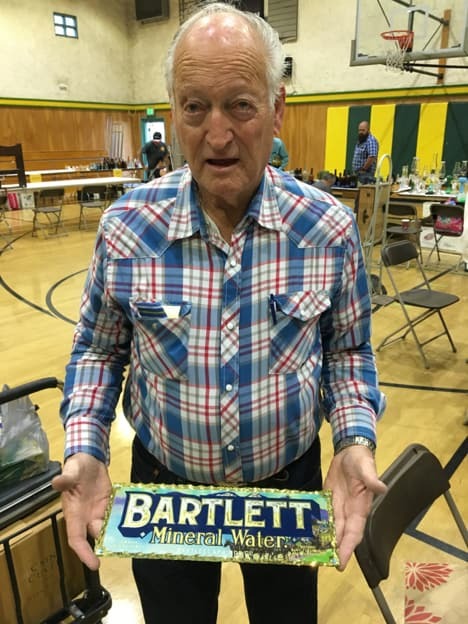 Richard Siri, Sr. is shown here showing off a beautiful little reverse glass sign for Bartlett Mineral Water, a once famous California product. 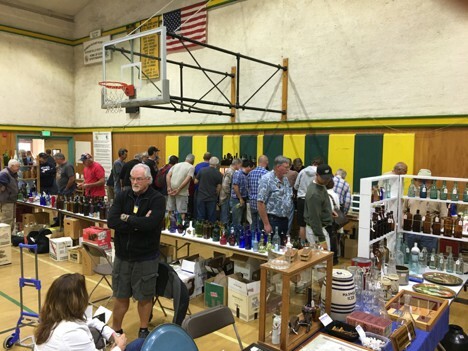 As is often the case Jeff Wichmann set up his sales table with considerable fanfare which stole the show for quite some time. I was especially taken by this newly dug fragmented bottle – perhaps the only known specimen of a beautiful blue large size PRATT’S NEW LIFE bottle, produced by the flamboyant medicine man, Perry Pratt, in the mid-1870s. 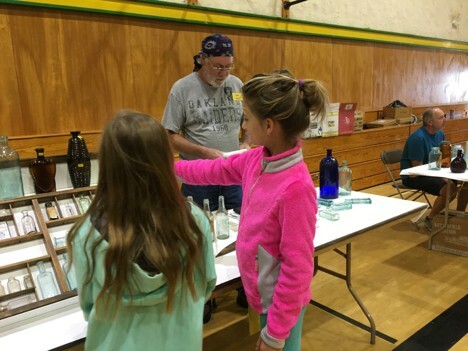 Dean Wright’s bottles were being scrutinized by two “next gen” collectors. Let’s hope they stick with it. 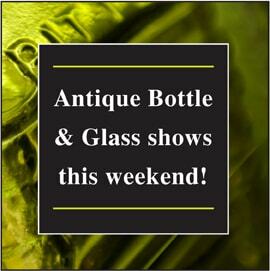 Dean is a regular contributor to the 49’er Bottle Clubs newsletter. For the last couple of years he has been reading and transcribing articles from early California newspapers beginning with the first days of the gold rush and publishing them in the newsletter. The information is amazing including items not recorded in any history books. 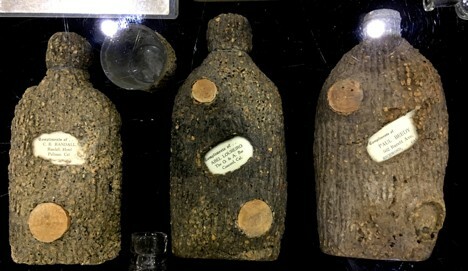 Dealer Ken Gaeta was selling three bark covered saloon flasks. These rustic looking flasks were a West Coast fad during the turn of the century and difficult to find since the covering is somewhat fragile. Just like many of the trees in the West which are now suffering from the prolonged drought, it appears these bottles have also been visited by bark beetles. 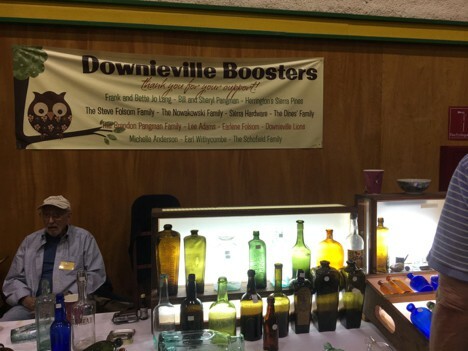 Goodbye Downieville Bottle Show, and may you soon be resurrected!